Kauto Star, partnered by Ruby Walsh, clinched his third victory in the £200,000 Grade One Betfair Chase at Haydock Park today, but connections had to wait for the judge to determine a photo finish after Imperial Commander came with a final late thrust near the line. From some way out it looked as if the race was between Imperial Commander and Kauto Star, with the latter asserting a clear advantage approaching the penultimate fence. While he looked to have the race in the bag, 4/6 favourite Kauto Star had to dig deep to hold off a renewed challenge from Imperial Commander and just a nose separated the pair at the finish. Trainer Paul Nicholls reported: “Ruby (Walsh) got off him and said ‘he needed it’ - they were the three words I wanted to hear. “He has just got a little bit tired today but he kept finding. He is a real professional. “I was not worried about the ground today. I was more worried about the fact that he might need the race. “Nigel’s horse (Imperial Commander) has run very well. I feared him as Nigel’s horses go so well fresh. I didn’t know whether we had won on the line, all I knew was that he had run a great race whatever happened. “I have learnt over the year that horses need their first run. When you see this horse at his age putting his head down in his chest and fighting like that it’s just great. Today was a great spectacle for the sport. 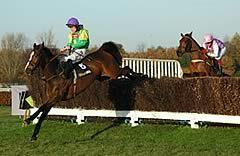 Kauto Star, owned by Clive Smith, previously won the Betfair Chase in 2006 and 2007. He fell at the last when disputing the lead in 2008. He also won the Cheltenham Gold Cup in 2007 and 2009, while he has taken the King George VI Chase at Kempton Park on three occasions (2006, 2007 and 2008). Kauto Star remains the 10/11 favourite for the King George VI Chase with totesport, while he is also unchanged at 6/4 with the same firm for the Cheltenham Gold Cup. Ruby Walsh, the winning rider on Kauto Star in the Betfair Chase, said afterwards: “I thought I had to go at Imperial Commander (entering the straight) - he was the doubtful stayer - we had won the Gold Cup. 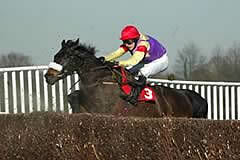 “Kauto Star just got tired going to the last and then he has dug deep to hang on. “I thought I was beaten but Kauto Star came back. He has won anyway. I thought Imperial Commander got by me for a stride and I was back ahead a stride later. “I was thinking I had used up my gas too early when Kauto Star got a bit tired coming to the last but that was the decision I had made by taking on Imperial Commander. “My tactical decision was to test Imperial Commander’s stamina and it just paid off - I thought it wasn’t going to for a time. “The ground probably took it out of him a bit - I know he is a better horse on better ground but I have been saying to Paul (Nicholls - the trainer) all week that good horses win on any ground. “Kauto Star is as good as last season - he is a wonderful horse - how many Grade Ones is that now ? (12) They were still knocking him in the paper all last week - it is like Manchester United - when you are on the top they want to knock you. Nigel Twiston-Davies, trainer of the second Imperial Commander, was devastated by the result and so was the jockey Paddy Brennan - getting beat by a nose when looking all over the winner. 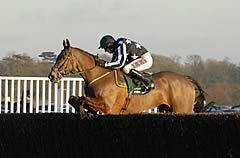 Twiston-Davies commented: “It is horrible but Imperial Commander did bloody well. “From every angle I saw, he had got it but there you are. I am sure the camera doesn’t lie. He has run a hell of a race. “We will keep trying at all the top races. We have to think whether we go back to the King George or not - I don’t know. He obviously prefers this way around (left-handed). “All the so-called experts said he couldn’t stay but how couldn’t he. He won around 2m 5f in the Paddy Power on soft ground ane he was powering up the hill. If this had been three miles, two furlongs, he would have won easily. Bring on the Gold Cup. “The King George - where else is there to go? Unless someone gives me a nice left-handed race then we have to do that. Tom Scudamore, rider of the third placed Madison Du Berlais, said: “He’s run a great race. His first time out record wouldn’t be that great, he normally improves for a race, but he’s still run a great race. He’s been beaten by two very very good horses.